Published: Nov. 3, 2013 at 10:30 p.m. Updated: Nov. 5, 2013 at 05:09 p.m.
No one knows when Michael Vick (hamstring) will be back in action, so picking up Foles makes a lot of sense. The Arizona product went off last week against the Oakland Raiders, throwing for 406 yards and a ridiculous seven touchdowns while scoring 45.64 fantasy points. 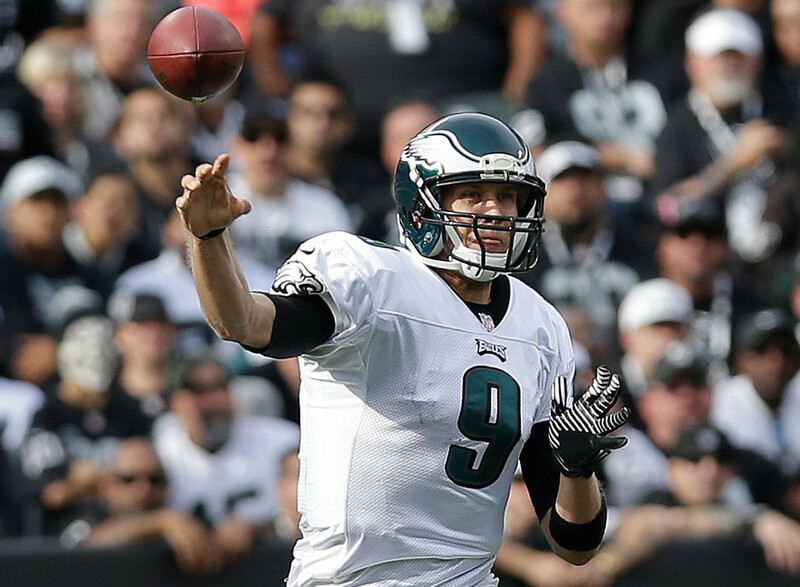 As it stands, Foles should be owned in more fantasy football leagues than the oft-injured and inconsistent Vick. Brown (leg) is eligible to be back on the gridiron for the Giants in Week 10, and all indications are that he'll return against the Oakland Raiders. With off-the-couch runners Brandon Jacobs and Peyton Hillis as his lone competition in the backfield while David Wilson is out, I expect Brown to emerge atop the depth chart sooner than later. He needs to be owned in all fantasy leagues. Ellington went off in his last contest, rushing for 154 yards with one touchdown while scoring an impressive 22.20 fantasy points in a game against the Atlanta Falcons. He wasn't picked up in a lot of leagues because the Cardinals had a Week 9 bye, so check your waiver wire and make sure he's not still a free agent. Ellington should see much more of the backfield work for Arizona. Who needs Doug Martin when you have James? OK, that's taking it too far -- but James had one heck of a game against the Seattle Seahawks with 158 rushing yards and one touchdown pass. Next on the schedule is a Monday night date with the Miami Dolphins, who have been awful against the run all season. Consider James if you need a flex starter or even a low-end No. 2 fantasy runner. Stop me if you have heard this before -- Darren McFadden is hurt. Again. That means it's Jennings' time to top the Raiders' depth chart if McFadden's latest hamstring ailment keeps him out of action in Week 10. Jennings was impressive in his absence against the Philadelphia Eagles last weekend, posting seven receptions, 176 scrimmage yards, one touchdown and 23.60 fantasy points. Jones recorded a mediocre stat line (6.6 fantasy points) in Week 9, but it should have been much better; he had a 50-yard touchdown nullified due to an offensive holding call. Overall, he's scored 11-plus fantasy points in three of his last four games and continues to be a valuable asset in Andy Dalton's offense. Jones needs to be owned in most fantasy leagues right now. Vereen (wrist) isn't eligible to come back until Week 11, but now is the time to grab him before everyone else in your league is hip to his return. In his lone game this season, he posted 159 scrimmage yards and looked primed to have a solid campaign. Vereen will no doubt come back and fill a prominent role in the Patriots' backfield, so grab him and stash him if he's available. Locker didn't have a good stat line against the St. Louis Rams, but that wasn't a surprise; their defense has been tough on quarterbacks at home this season. The main reason to add him is the fact that he's scored 19-plus fantasy points in three of his last four games and has a great matchup next against the Jacksonville Jaguars. Locker also faces the Jaguars again in Week 16. Wright was listed in this space last week, but he's still available in almost all fantasy leagues on NFL.com. That shouldn't be the case after Week 9, as he scored 11.80 points in a win over the Seattle Seahawks. Wright has also scored nine-plus fantasy points in three of his last four games overall, so he's not only productive, but he's also scoring points on a very regular basis. Brown has been hot lately, scoring a combined 22.30 fantasy points in two games before Jacksonville's bye week. His value rose even more with the news of Justin Blackmon's indefinite suspension, as Brown will now move up the depth chart and start opposite Cecil Shorts. He isn't going to be a fantasy star, but Brown is now worth a roster spot in leagues with 10-plus teams.